Isn't it funny how judging something these days has become second nature for most of us? One glance, one piece of information or almost anything gets us to form an opinion, without seeing the whole picture. You could blame social media for it, or just the fact that nobody's got the time to look beyond. Take me, for instance. 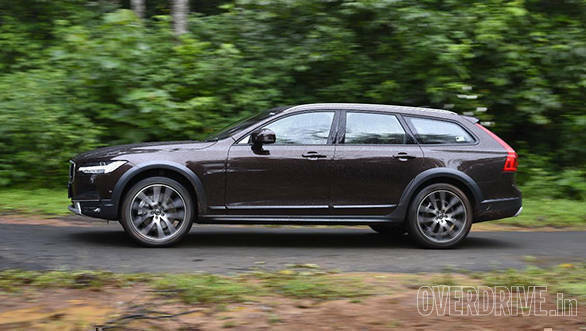 After taking a good look at the pictures of the new Volvo V90 Cross Country, I thought of it as a jacked-up Volvo V90 estate with some AWD goodies to befit the Cross Country badge - the usual crossover formula. But here I am, in Madikeri, Coorg, after having driven the V90 Cross Country from Mangalore and that old adage of not judging a book by its cover has hit me, smack in the face! We did get a chance to sample the Volvo V90 Cross Country, earlier this year, in the frigid environs of Sweden where Bert was pretty pleased overall with what the car was capable of, in those conditions. Back home, the V90 Cross Country is already starting to impress me, especially with the way it looks. Now don't scoff at the estate car silhouette and think of it as a design dud in India. Pictures actually don't do justice to how good looking the car is when you see it in the flesh. The V90 Cross Country looks handsome, whichever angle you look at it from. The long body, low roof line and that tastefully executed estate rear look great, and why wouldn't it? The body panels, such as the bonnet and the doors, right up to the C-pillar are exactly like the Volvo S90, which in my book is among the most stunning automotive designs. From the C-pillar onwards, including the floorboard, is all V90. The dazzling adaptive, bending LED headlamps and the signature Volvo style LED tail lamps are other design highlights. And then there's the stance of the car. 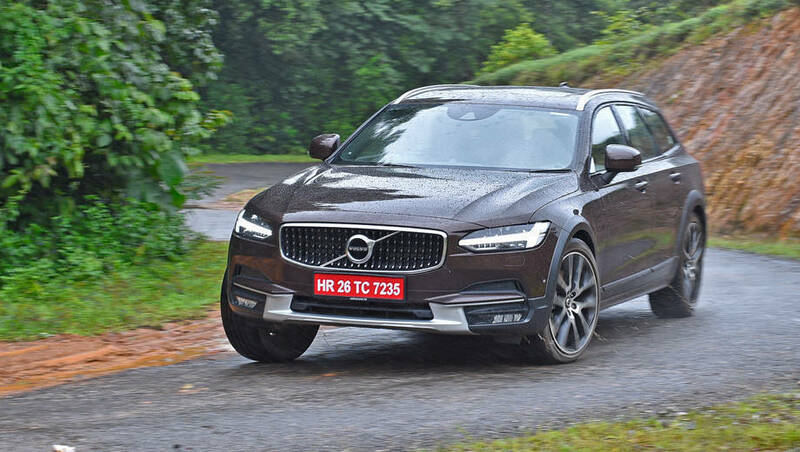 At 210mm, the V90 Cross Country has SUV-rivalling ground clearance, and those gorgeous 20-inch, 10-spoke alloy wheels are simply something else. Step inside and you are greeted with the familiar interior that debuted in the XC90. 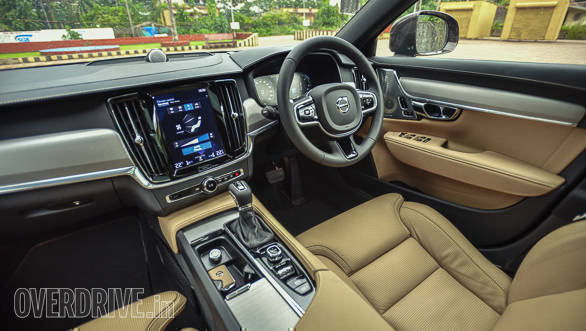 For the V90 Cross Country though, Volvo has adorned the cabin with aluminium inserts instead of wood. The V90 also gets a new steering wheel, with paddle shifters, a feature still unavailable in the S90. 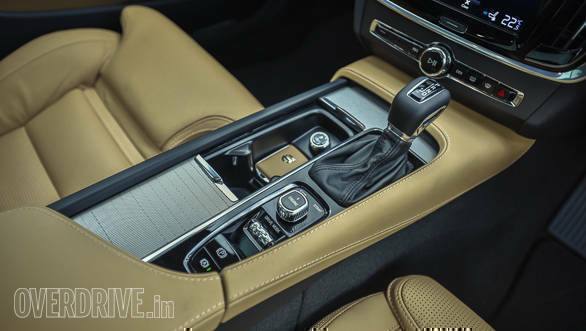 The car also gets the same seats designed in association with orthopaedics that you see in the S90. However, the party trick in these is the massage function for the driver and passenger seat. It offers various types and intensity of massages, and judging by how quickly Rohit dozed off, they certainly are damn good. Surprisingly, this feature is not available in the rear seats. The 19-speaker Bowers & Wilkins music system is incredible, and by far one of the best sound systems in the luxury car market. The attention to detail that has gone into designing the cabin is one of best we've seen, and overall the interior exudes that classy, minimalist Swedish design that I personally love. 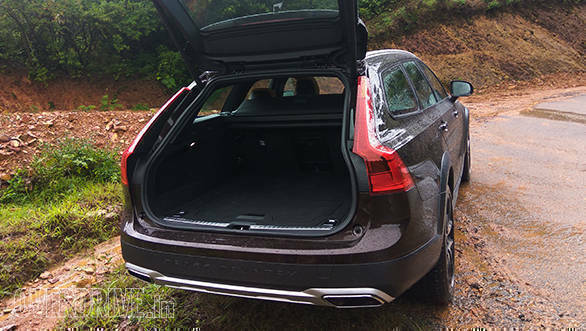 The biggest draw of the estate style body, is offcourse, the cavernous, 560-litres of boot space that can be increased to a whopping 1,526 litres by dropping the electrically foldable rear seats. Turn the starter knob to fire up the engine and the first thing that you'll appreciate is the refinement of the D5 diesel motor. It displaces 2 litres and produces 235PS with 480Nm of torque on tap. And I say on tap, because there is not even a hint of turbo lag. 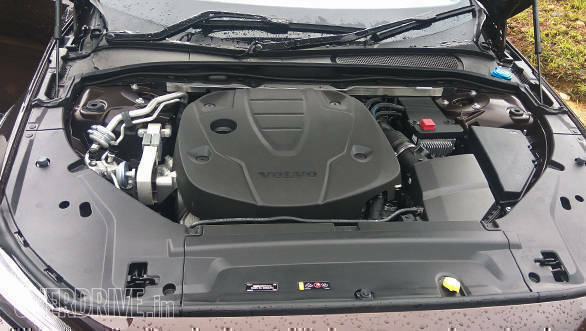 That's because the D5 motor comes with Volvo's Power Pulse technology that eliminates turbo lag. Turbo lag occurs because the turbocharger only spools up once there's enough exhaust gas pressure to rotate the turbo fan. This usually happens post a certain rpm, say, 2,000rpm in the case of most diesel engines. What the Power Pulse system aims to do is spool the turbo even before exhaust gas pressure is built up. The system consists of an electrically operated air compressor that feeds air into a storage tank by sucking air from the air intake. The tank sends a charge of compressed air, to spool the turbo, every time the driver steps on the throttle. What you get is an instant response from the motor as the turbo now kicks in from 500rpm onwards. Power delivery is quite linear too and the engine itself feels very punchy through the rev range. The shifts by the 8-speed automatic transmission is quick. However, downshifts feel a tad slower probably because the system wants to avoid over revving the engine. Volvo is offering four driving modes in the V90 Cross Country  Eco, Comfort, Dynamic and Rough Road. Each mode alters steering and engine response as well as the rear air suspension; however, Rough Road mode also alters the car's height, or rather, keeps the car level irrespective of the load. This is courtesy of the air suspension at the rear that perfectly complements the double wishbones at the front. Driving the car over a variety of terrains, from broken roads, to pothole fests, to smooth highways, the ride quality is absolutely astounding. It feels firm over the bumps but not jarring at any point and to be able to do this despite running those large 20-inch wheels with 245/45 section tyres is just mind-boggling. And then the car surprises with its driving dynamics. 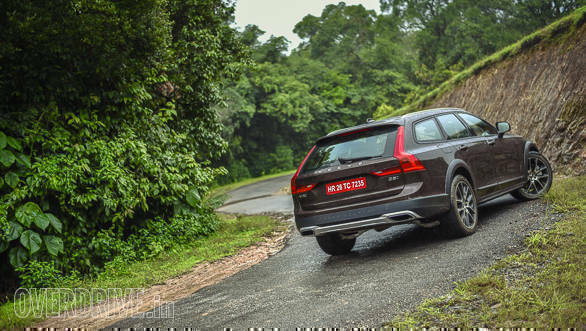 The roads up to Coorg offer a lovely set of corners, and Rohit and I were having a blast chucking the Volvo V90 Cross Country around the bends. Firstly, once you get behind the wheel, the V90 doesn't feel too large, as if it shrink-wraps around you. 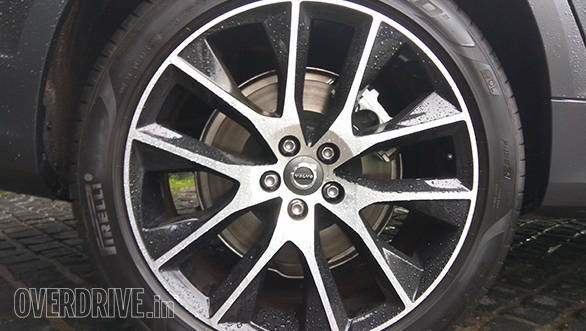 And then the brilliant Haldex AWD system offers amazing levels of grip, also aided by the specially made Pirelli P Zero tyres. Rohit, in fact, was all praise for the seamlessness with which the system vectored torque between the front and rear wheels. For a car that long, the V90 is truly a charmer around corners. Also adding to the sense of cornering confidence is one of the most precise steerings that we've seen on a Volvo. That and the paddle shifters make it an absolute hoot, and it's something that is better experienced than read about. Let's get one thing straight, the Volvo V90 Cross Country is not a hard-core off-road vehicle. In fact, the car is primarily front-wheel drive with the AWD sending torque to the rear wheels only when required. 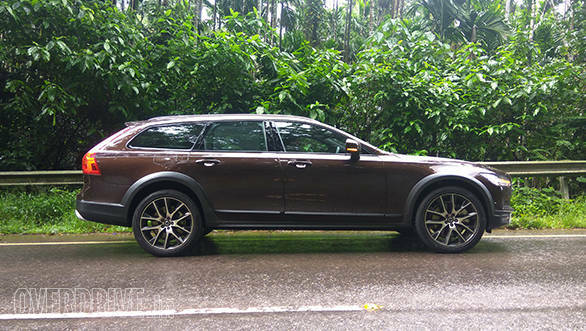 To test the car's off-road ability, we drove up a steep, slushy incline in a coffee estate in Coorg, with a full house. With the car in Off-Road mode, the air suspension automatically levelled the car to compensate for the extra weight. In this mode, the ride is raised further by a few millimetres, which enhances the car's ability to tackle the rough terrain. The AWD system has the ability to send torque to each wheel and that's what made driving up so effortless. The Pirelli P Zero tyres offered decent grip levels, which is acceptable since these are performance-oriented road tyres. On the way down, the Hill Descent Control (HDC) worked like a charm, taking over the braking duties and ensuring that the car made it to the bottom of the hill without any brake inputs from my end. 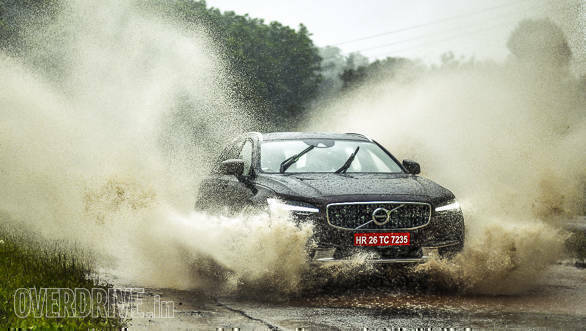 All said, it's obvious that most owners won't really bother driving the car off-road, but for those who may want to go off the beaten path, the V90 Cross Country can handle a bit of driving off-road without the need to bother about underbelly scrapes. 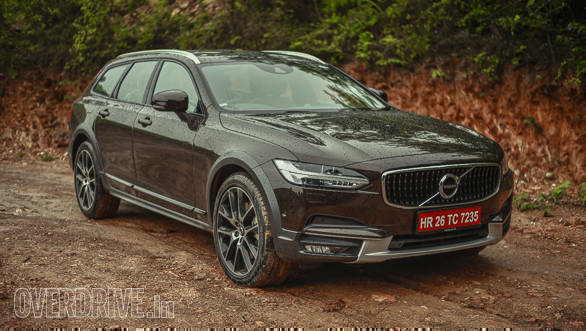 The Volvo V90 Cross Country has been a revelation. You don't usually expect a Volvo to ride and handle the way the V90 does, especially when you consider its size and off-road ability. The IntelliSafe radar safety system is a boon and it works pretty well in our conditions too. 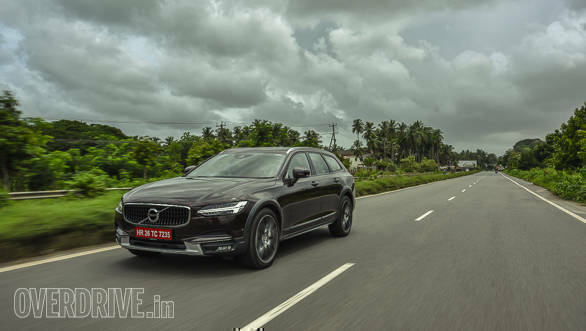 The car is expected to create a place for itself in market, and that's what Volvo India believes. It's aimed at those who want the comfort of a sedan with the general practicality of an SUV. 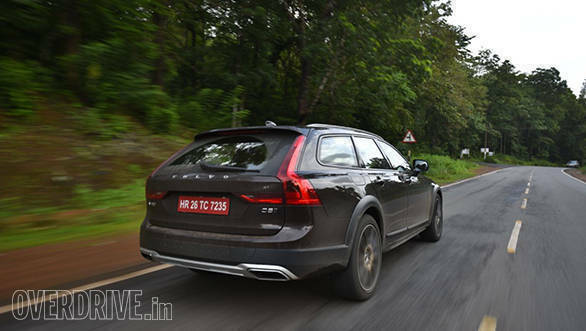 It's sort of like the best of both worlds and this is going to be the V90 Cross Country's forte, here in India. I'd say, judge it after you've experienced it.